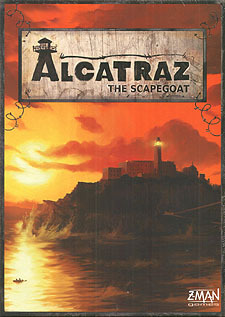 Alcatraz: The Scapegoat is a cooperative game for 3-4 players which features an innovative 'scapegoat' mechanic. The players cooperate in order to escape from the legendary prison, but they also know that, according to the plan, one person has to stay on the island as the eponymous scapegoat. So who is going to be the scapegoat? The most useless player, and you don't want to be that guy! And so begins the game of conflicted loyalties. In Alcatraz: The Scapegoat you are not exactly trying to be the best in the group - your personal objective is to become indispensable. This means that each round you will bluff, rat, rob other players, betray and blackmail them. But if you are too slow completing your tasks, the guards will discover your plan - and each of you will serve time. A looooong time. Alcatraz: The Scapegoat provides you with unusual and original game dynamics as well as a real feeling of conspiring in a prison. Thanks to the modular board consisting of double-sided location tiles, each game will be unique. Hopefully YOU will escape to tell the tale.